Wesbild is honoured to be nominated for the Tri-Cities Chamber of Commerce 2018 Business Excellence Awards in the category of Community Spirit. 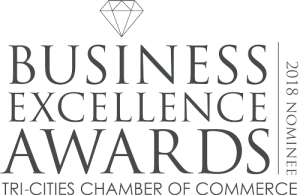 Every year, the Business Excellence Awards recognize outstanding Tri-Cities’ businesses, organizations, and individuals that demonstrate excellence in business and a passion for our community. The Community Spirit category nominates a business or individual that demonstrates an outstanding generous spirit by way of support for the Tri-Cities. This includes using resources to provide outstanding support to local initiatives and not-for-profits, demonstrating a passion for community and making positive difference. Wesbild takes our responsibilities as a corporate citizen very seriously and we have been passionately giving to the wider community since we began in 1981. For that reason, Wesbild is honoured to be nominated for this community focused award. Whether it be our support for SHARE Family & Community Services, the Wesbild LIFT Scholarship Program or one of our many other community based initiatives, our goal is to truly find a way to help individuals have better lives.